Supports your writing utensil for a more relaxed hand when writing. Manufacturer: North Coast Medical Inc.
No grip needed for writing. Supports hand and finger for control needed to write. Can be bent for custom fit. 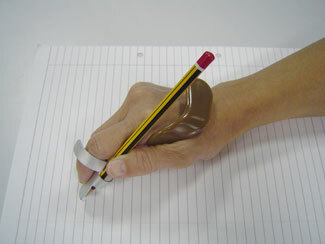 The Wanchik's Writer supports a writing utensil allowing a more relaxed hand when writing. 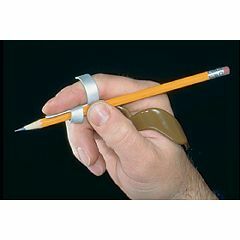 This writing splint slides comfortably on the hand, wrapping around the palm between the thumb and the index finger. The plastic covered aluminum can be bent for a custom fit. Insert a standard pen or pencil into the Wanchik's Writer holder for writing without gripping. To determine the size needed, measure the length of index MP to DIP crease. The small size fits 2.5 to 3.5 inches, large fits 3.5 to 4.5 inches. Use with: Standard pencils and thin ballpoints. 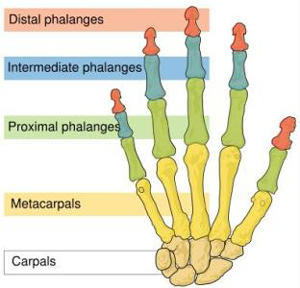 Interesting but hard to work with finger arthritis. Primary problem is index and pen holder is not in a workable position. If, these two positions were extended to the side a bit more, it would be a very workable tool! I will make some adjustments so my wife can maybe use it!